All about the views: Pigeon Spire. Is it the greatest 5.4 in the world? Having considered an alpine start to the famously long Northeast Ridge of Bugaboo Spire, Daniel and I (Nick) were instead tempted by new friends into taking on a shorter and more leisurely objective: The West Ridge of Pigeon Spire. Pigeon Spire. The red line delineates the route along its jagged spine to the summit. Since our arrival in the Bugaboos, the West Ridge of Pigeon Spire route was constantly extolled by climbers of all ages and abilities. Leaving from Applebee campground, it takes roughly 5 hours, round-trip. Climbers must ascend the challenging Bugaboo-Snowpatch col and walk across the Bugaboo glacier to reach the base of Pigeon Spire. Although the West Ridge is a relatively non-technical climb, Daniel and I recognized the outing would allow us to practice our alpine abilities. Ascending a col and traversing a glacier are both important alpine skills we had yet to practice. The col. The finger of snow farthest left is the most popular ascent route. The middle finger has a 70 meter fixed line, and is almost exclusively used for descending. Being the only climbers foolish enough to face the Bugaboos without crampons, we were unsure how well our shoes would grip into the snow. However, the ascent went surprisingly smoothly. The sparse snow remaining in the col had been gradually compacted throughout the preceding year and was therefore very dense. Consequently, Daniel and I felt unexpectedly secure when our piolet shafts were driven deep into the snow, making us much less nervous during the climb. On top of the col, we surprisingly met our friends Paul and Pat, who had departed camp 6 hours earlier intending to climb The Kain Route. After seeing how much of the route was 4th class scrambling on chossy rock, they decided instead to descend the col and return to camp. Happy to see them, we all got together for a photo. A dilemma arose when Paul and Pat asked for our advice on how best to descend the col. Daniel and I were clueless, and had written off the problem for our future selves to deal with. Shrewdly aware that we were alpine neophytes, they decided to handle the descent on their own. Just as Pat and Paul turned back towards the col, another party appeared in our peripherals, descending the Kain route. Upon closer inspection, the middle of the three moved with a supple grace that immediately conveyed professionalism and confidence. As they drew closer, the man in red (descending between two strikingly beautiful women) stirred a feeling of familiarity in some unconscious level of my perception. In particular, the mysterious figure was wearing a helmet patterned with distinctive, rich primary colours. 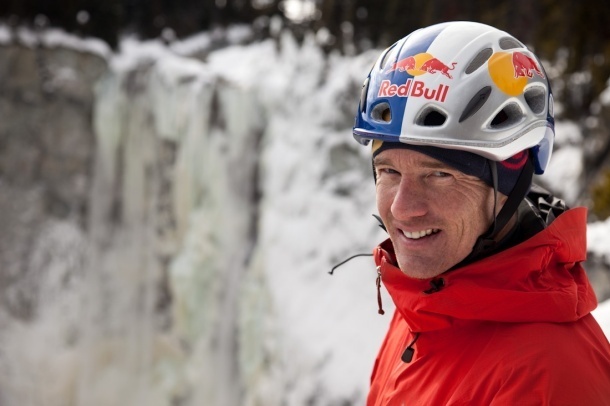 Like many fellow plebeian climbers, I've spent countless hours watching movies and short videos of my climbing heroes, fantasizing about some day donning the helmet worn by the demigod-esque Redbull athletes. The cynosure adorning the cranium of this man brought me to realize we were in the presence of an elite climber. Surely enough, the legendary Will Gadd was finishing up a casual day climbing in the Bugaboos. He approached us, and sensing Paul and Pat's apprehension about the descent, cheerfully offered to give them his assistance. We left our friends in the calloused hands of the climbing deity, and headed on our way across the snow-covered glacier to Pigeon Spire. The ensuing climbing was so picturesque, Daniel and I found it hard to convince ourselves that the surrounding vista wasn't cast on a green screen. Not bad for a second day in the mountains. The descent down the col at the end of the day gave us little trouble, and we returned to Applebee in an early evening glow. We were just in time to watch a full moon rise over the Southern Purcell mountains. A comment on mountain project lauds the West Ridge as "the greatest 5.4 in the world." I have climbed admittedly few excellent 5.4's, but nevertheless, I would believe the statement. For readers of any ability planning a trip to the area, this climb is not to be missed. Officially giving the Chossboys' stamp of approval.